Hieronymus Bosch (c 1450–1516), Christ Carrying the Cross (detail) (c 1495-1505), oil on oak panel, 142.8 x 104.3 cm, El Escorial, San Lorenzo de El Escorial, Spain. Wikimedia Commons. The largest panel among Bosch’s works, it is quite different from his other, smaller version of this motif. Seen much closer in, he concentrates on Christ and a small group around him, giving the cross itself an unusual form. This is a second painting of the same motif, this time apparently intended just as a single panel. Here Bosch works not from the account given in the Gospel of Saint John, but one of the other three gospels, as he shows Simon of Cyrene helping Christ carry the weight of the cross. It also omits any reference to the criminals who were crucified alongside Jesus. 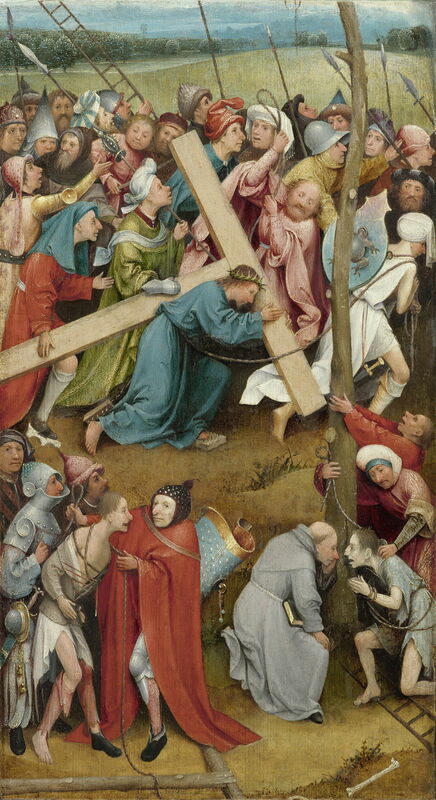 Hieronymus Bosch (c 1450–1516), Christ Carrying the Cross (c 1495-1505), oil on oak panel, 142.8 x 104.3 cm, El Escorial, San Lorenzo de El Escorial, Spain. Wikimedia Commons. Christ is seen below and to the right of centre, wearing his crown of thorns and looking directly at the viewer. He wears brown robes, and his feet are bare. Suspended from his waist are two spiked boards which dangle under his feet as he walks, piercing his feet. He is bent low, the heavy weight of a finished ‘Tau’ cross on his left shoulder. His face is almost impassive, but a single tear is rolling down his right cheek. The cross has been projected in an unusual way, so that it does not look entirely square when viewed straight on. Behind him, an old, bald and bearded man wearing a red robe (who may represent Saint Peter) uses the loose end of a rope to whip Christ with. 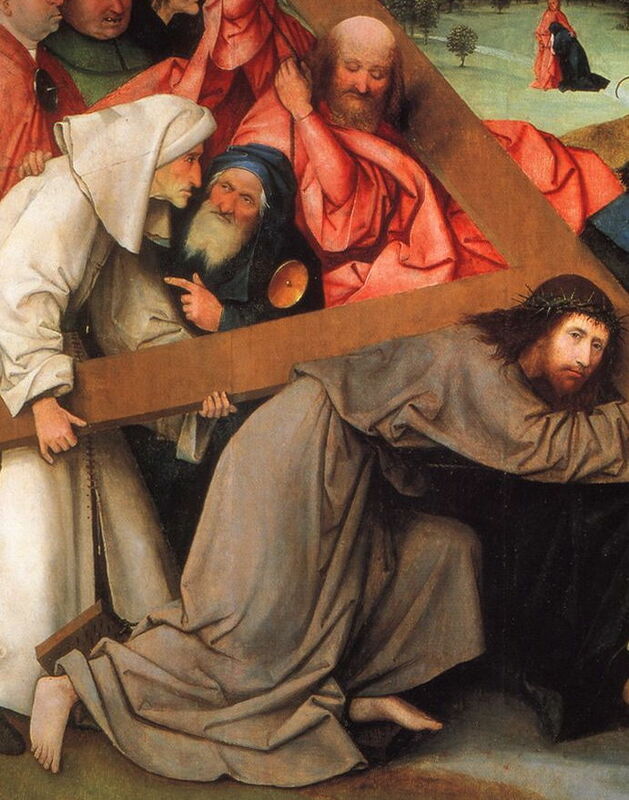 Further along the upright of the cross, Simon of Cyrene helps bear some of its weight. He wears white robes and chaperon. Between him and the man in red is another figure who appears to be a Pharisee, who is wearing dark blue robes and is talking to Simon. In front of Christ, at the right edge of the painting, a military figure with armour is leading the group, pulling Christ along by a rope. That soldier has a white crescent moon on his armoured collar. Seven men are in a close group at the left, behind Simon, the Pharisee, and the man in red. Above their heads there are spears raised, a white pendant, and a ceremonial trumpet. In the middle distance, Saint John the Apostle, wearing red robes, stands to comfort a kneeling woman, presumably the Virgin Mary. Behind them is a pastoral landscape of open grassland with woods, receding to a Brabant city in the far distance. No other figures or creatures are visible, but a Tau crucifix is visible on top of one of the towers in the city. In contrast to his other version of this motif, Bosch’s composition of this painting is more conventional. In effect, he has closed in on the centre of that other version, and shown just Christ and his immediate group of twelve people. Hieronymus Bosch (c 1450–1516), Christ Carrying the Cross (1490-1510) (CR no. 12), oil on oak panel, 59.7 x 32 cm, Gemäldegalerie, Kunsthistorisches Museum, Vienna. © Kunsthistorisches Museum, Gemäldergalerie, KHM-Museumsverband, Wenen, via Wikimedia Commons. This is, though, a much closer view than many other depictions. Hans Memling (c 1433–1494), Carrying the Cross (c 1475), oil on oak panel, 58.2 x 27.5 cm, Museum of Fine Arts, Budapest. Wikimedia Commons. 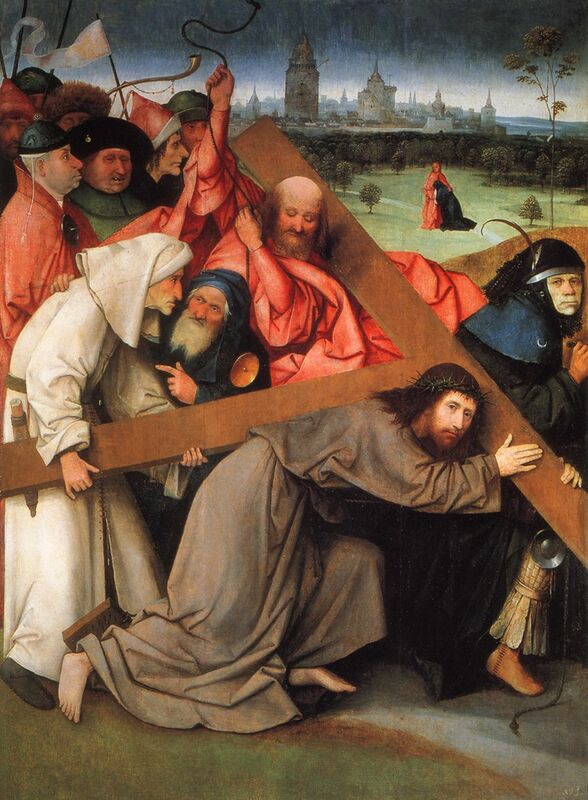 That adopted by Hans Memling in his earlier Carrying the Cross (c 1475) shows Christ leaving the gate of Jerusalem, and without the two criminals for crucifixion. Similar views were used by other artists of this period. Quentin Matsys (1456/1466–1530), Christ Carrying the Cross (c 1510-15), oil on panel, 83 x 59 cm, Rijksmuseum, Amsterdam. Wikimedia Commons. 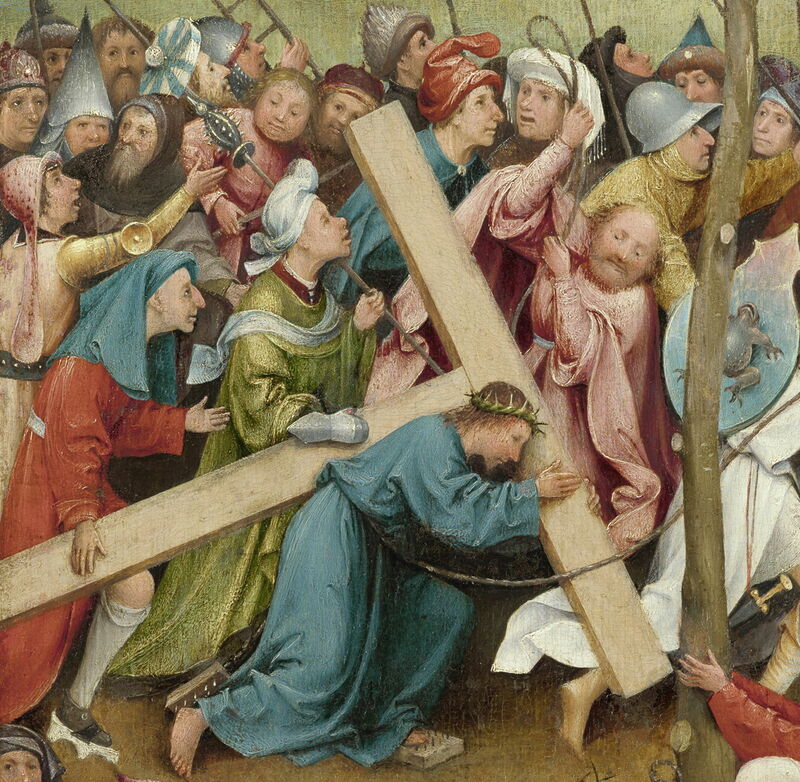 Quentin Matsys, in his Christ Carrying the Cross (c 1510-15), shows a closer view comparable to this, but exaggerates the suffering, and lacks Bosch’s masterly subtlety. The only figure seen in this painting which appears very similar to others in Bosch’s works is the man wearing red robes. Hieronymus Bosch (c 1450–1516), Christ Carrying the Cross (detail) (1490-1510) (CR no. 12), oil on oak panel, 59.7 x 32 cm, Gemäldegalerie, Kunsthistorisches Museum, Vienna. © Kunsthistorisches Museum, Gemäldergalerie, KHM-Museumsverband, Wenen, via Wikimedia Commons. He appears in the same role in the other (Vienna) version. Hieronymus Bosch (c 1450–1516), Saint John the Baptist (detail) (c 1490-95) (CR no. 5), oil on oak panel, 48.5 × 40.5 cm, Museo Fundación Lázaro Galdiano, Madrid. Photo Rik Klein Gotink and image processing Robert G. Erdmann for the Bosch Research and Conservation Project, via Wikimedia Commons. 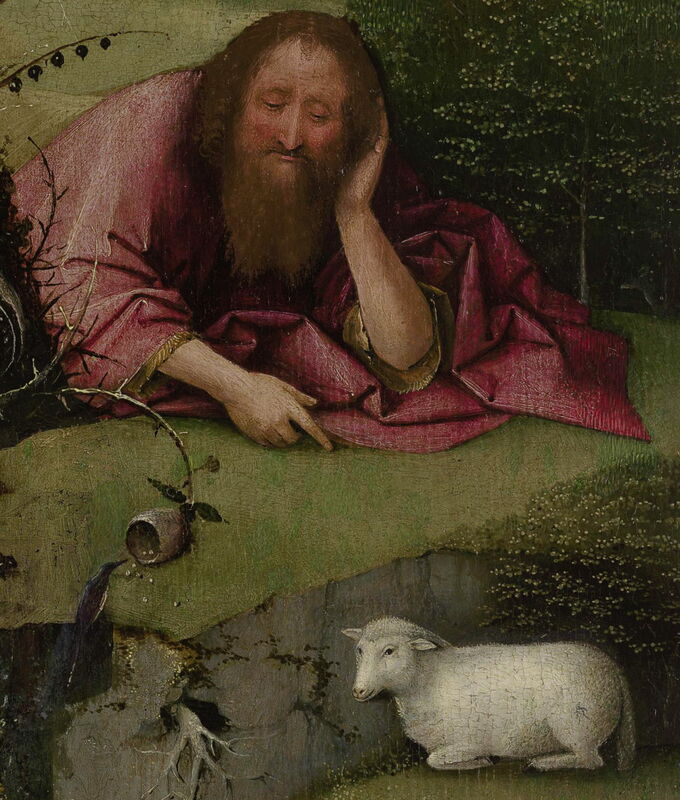 He is also remarkably similar to Bosch’s depiction of Saint John the Baptist. As it is generally accepted that John the Baptist was executed during the ministry of Christ, and well before his crucifixion, this cannot have been intended to represent him. However, the apostle Peter was definitely a witness of the Resurrection, and was present at various times during the Passion. Despite the visual similarity between the man in the red robe and Bosch’s painting of Saint John the Baptist, if Bosch intended us to identify that individual, I think that the most likely candidate is Saint Peter. Ilsink et al. 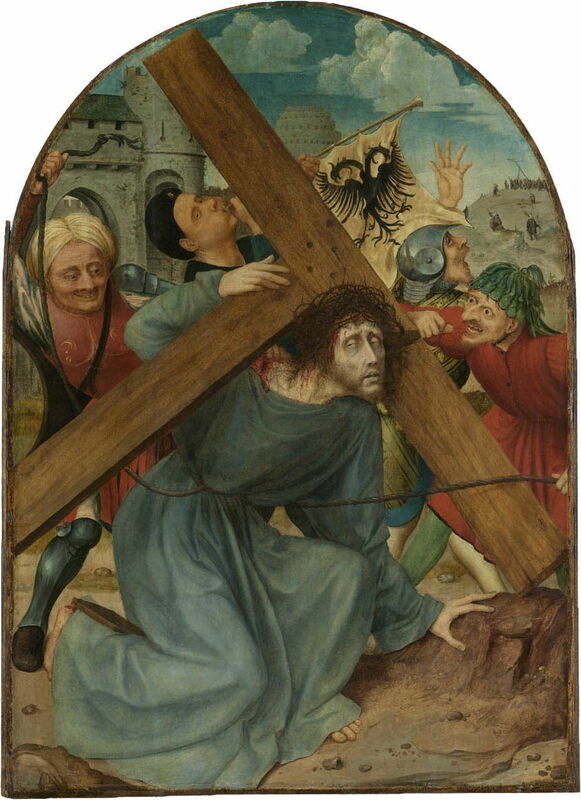 have drawn attention to the unusual form of the cross, which appears to have been projected in the expectation that this painting would be viewed from a certain direction and angle. They stress that it is unconscionable that this was a geometric error on Bosch’s part, but its purpose remains a mystery. 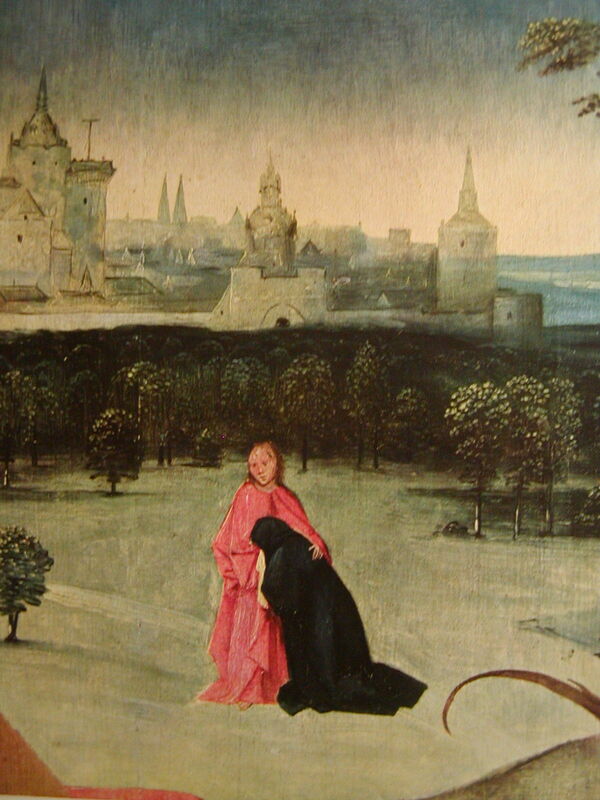 The figures of Saint John (the Apostle) and the Virgin Mary in the middle distance are the only other creatures shown in the painting. This detail view shows more clearly the Tau crucifix mounted on the top of one of the towers in the distant city. This painting has not apparently been the subject of any dispute as to it being an authentic work by Bosch’s hand. There is also no evidence that it was altered in any significant way following its first completion, except for some restorative retouching of worn areas of paint. It was acquired by King Philip II of Spain in 1574, and has remained in Spain ever since. However, its original location prior to export is unknown. Matthijs Ilsink, Jos Koldeweij et al. (2016) pp 248-259 in Hieronymus Bosch, Painter and Draughtsman: Catalogue Raisonné, Yale UP and Mercatorfonds. ISBN 978 0 300 22014 8. Posted in General, Painting and tagged Bosch, Matsys, Memling, painting. Bookmark the permalink.